Entertainment articles are to be used in field meets at specially prepared sites as simulators of hand fragmentation and smoke grenades. Hand imitation grenade is equipped with pyro element, retarder assy and filled with paintball and strikeball elements. All structural grenade parts including safety lever are made of safe foamed polyurethane. Boldly designed retarder assy provides a stable time before activation. The grenade is equipped with dual system of protection against spontaneous operation. Proposed grenade is additionally provided with safety lever, which prevents actuation when retained. The pyro element provides realistic sound effect, at that it is safe both for probable ignition of dry grass and leaves and for spontaneous operation. Grenade is hand thrown after pulling off the primer ring. Grenade burst occurs after operation of the retarder system under action of pressure of gasses generated by pyro element operation inside the casing. 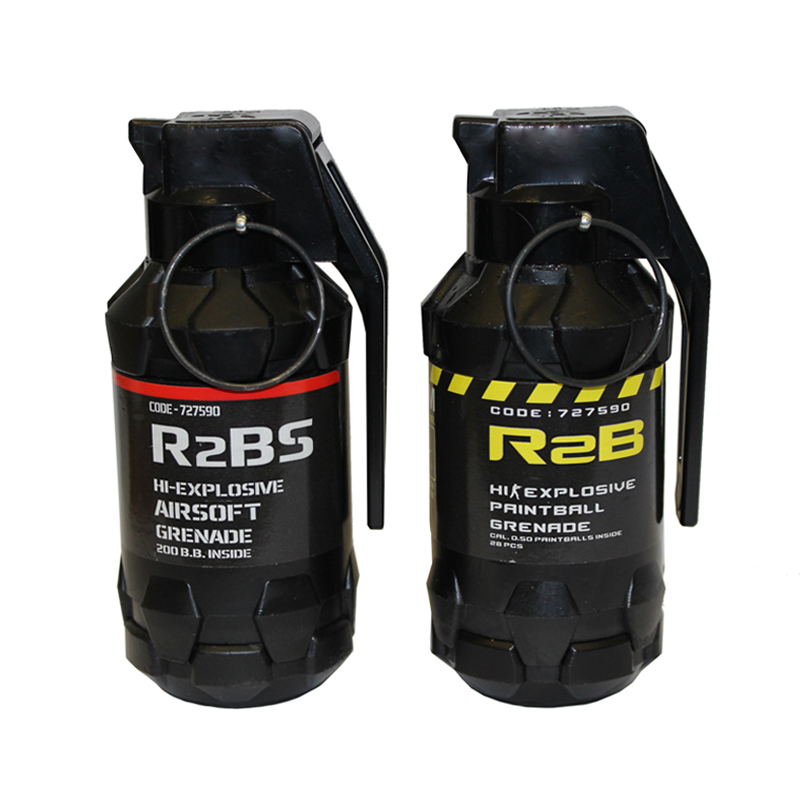 R2B grenade uses special easy-washable composition based on nontoxic components as simulating strike substance. When R2Bs grenade bursts, 6mm-dia plastic balls for electrically driven air gun are spread. — Grenade weight: 95 g.
— Retardation interval: 2.8–3.2 s.
— R3Bs load: electrically driven air gun balls – 210 pcs. 1. Pyro articles for field meets are used at specially equipped sites, remote from residential and crowded areas. 2. Prior to use, make sure that there are no people within the expected dangerous radius, apart from participants of field meet provided with individual protection means. 3. After removal from the package, grenades may be carried to the place of use in special ammunition carrier only providing grenade integrity and protection against spontaneous operation. — use the articles without special individual protection means for head and eyes. — use the article without assuring safety to health and property of people around. — hold grenade in hand longer then required for throwing after pulling out the igniter ring. — use the articles without reading of instructions. — disassemble, update or reload grenade; misuse it. — use article with expired shelf life and obvious indications of damages.